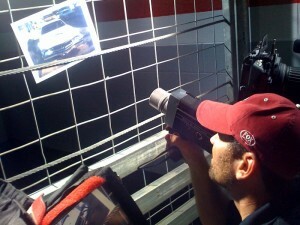 Clark Crew Goes Old School… Charlotte Director of Photography shoots film for Fox Sports NASCAR. Go To Team Elite Camera Crew & Video Production Crew | Clark Crew Goes Old School… Charlotte Director of Photography shoots film for Fox Sports NASCAR. Everyone is talking about 1080i, 720p, 24fps, P2, DVCPro HD, HDCam, AVC, SD Cards, Compact Flash Cards, Solid State, Hard Drives, and everything else! But what about just good-old-fashioned film?! Well, Go To Team’s Charlotte-based Varicam crew, Skip Clark and Dan Lowrey, are still using it! Skip wanted to bring a different look to Fox Sports for all of their NASCAR driver melts so he found an old Nikon Super 8 camera and he’s been using it throughout the NASCAR Sprint Cup Series season. Go To Team gets all their film and processing from Pro 8mm in Burbank, CA, and the turn-around for the processing is just right that he can shoot Victory Lane one week and have the footage for the next week’s Pre-Race show. Skip and Dan shot the drivers on the grid, the cars on the track, the Victory Lane celebration, and even pictures for stories. The organic grain and texture of the film added an element to each week’s production that can be too hard and too time-consuming to replicate in the edit. Be sure to keep film in mind next time you’re trying to think of another way to shoot! Oh, and by the way, all that other stuff? The 1080i, 720p, etc? Go To Team has all that too!